Special Ticket Price for Roc(k)tober!! For those fans out there looking to see Orpheum at the Roc(k)tober!! 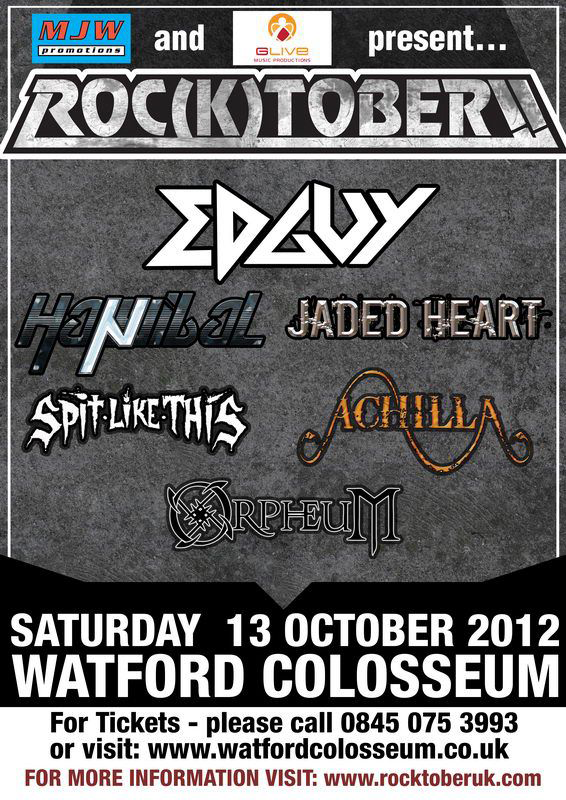 Festival at the Watford Colosseum on Saturday 13th October, a special discounted price is available just for you. Head over to this site www.mjwp.biz/orpheum.php to grab yours and we’ll see you then! Tickets for Roc(k)tober!! on Saturday 13th October are now available via TicketWeb! The Roc(k)tober!! 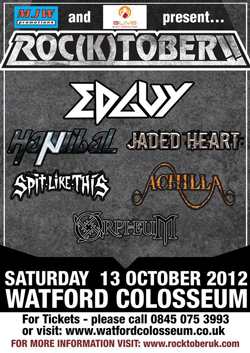 Festival to be held at the Watford Colosseum on Saturday 13th October is drawing ever closer, which will be headlined by German power metal band Edguy as part of their 2012 Age Of The Joker Tour. Orpheum have the pleasure of opening proceedings, which we’re very excited about and are getting ready to open the show with a bang! The event is also going to be filmed, so we suggest you get there early and to the front if you’d like to get on camera! A track from our Treason EP will be played tonight (Sunday 9th Sept) on the PROG MILL radio show on Stafford Radio – www.staffordradio.com by Mr Shaun Geraghty. The show is on the air 10pm to midnight and we should be on between 11:30 and midnight, so tune in from the get go for some great prog!